One of the most important rooms you’ll get to design is your bathroom. There are many design elements you get to pick out when building your new custom home. One of the most important rooms you’ll get to design is your bathroom. There are so many options to choose from for your new custom bathroom. Instead of sitting there dreaming about your next trip to the spa, design your own personal spa retreat right in your home! One of the easiest ways to create a relaxing, spa-like atmosphere is to get rid of the clutter. When you walk into your favorite spa, there are no cosmetics strewn on the counters. If you have a lot of hair or skin care products that you like to use regularly, choose a vanity with plenty of storage so you can keep your favorite products close at hand but out of sight. A tray placed on the back of the toilet can hold a couple of bottles of your favorite lotions. Clear glass jars can store cotton balls, cotton swabs, and bath salts. The colors you choose for your bathroom will really set the tone for the space. You don’t want anything super bright, as these shades will do the opposite of relax. You will want to choose more neutral colors. White, beige, and blue are all great options. Many pastel shades would work as well if you’re not a fan of keeping it neutral. 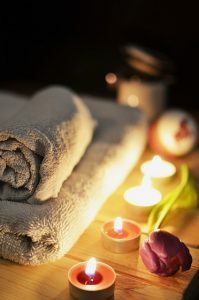 The idea is to choose colors that will help to create that relaxing spa atmosphere. Everyone’s favorite part of a trip to the spa is getting a massage. You can get a mini-massage every time you shower if you upgrade your shower head to a massage shower head. Do some shopping around. There are many different massaging shower heads on the market, so you can find the one that works best for you. Your tub is the crown jewel of your spa bathroom. Whether it is a freestanding claw-foot or perhaps a tub for two, your tub will likely be the most relaxing part of your bathroom. Jetted tubs are great for those who enjoy a good soak in a Jacuzzi. Upgrade your tub even further with a waterfall faucet and while you’re waiting for your bath to fill up you can just relax and listen to the waterfall. This entry was posted on Thursday, February 7th, 2019 at 9:48 pm. You can follow any responses to this entry through the RSS 2.0 feed. You can leave a response, or trackback from your own site.